There is no better way to introduce the travelling consumer to the world of Armagnac than through taste – and that is exactly what Chabot is doing throughout the month of October in partnership with Lagardère Travel Retail at Paris Charles de Gaulle Airport. 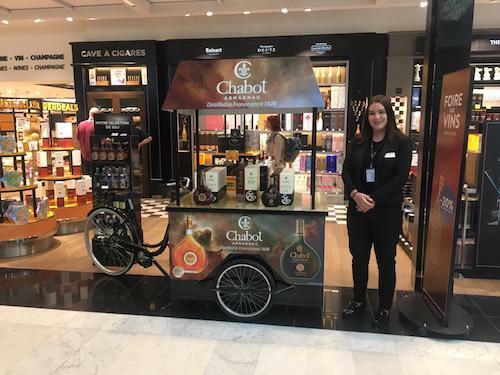 Two of Chabot’s most popular Armagnac from The Heritage Collection are being introduced to consumers through a bicycle themed activation that brings the flavour of the Armagnac region in store. Brand ambassadors are on-hand to unveil the secrets of Chabot Armagnac through tastings and information, including a regional map to explain exactly where this most distinctive of brandies originates. Taking place in CDG Terminal 2 Departure Shop (LFM6) from October 9 to November 5, the activation features Chabot’s Napoléon Special Reserve and flagship Armagnac, the X.O. Superior. Says Chabot Armagnac President Kathleen Gentzbourger: “We have developed an excellent partnership with Lagardère and are very pleased to be working with them on this tasting activation. We have aimed – in a simple way – to bring a flavour of historic Armagnac into the airport and introduce the diversity of our collection by sampling two very individual expressions.” In tasting the Armagnacs, consumers are able to experience for themselves the indulgent Napoléon Special Reserve with its blend of dried fruits, spice and oak notes or the prized X.O. Superior with its exceptional flavour and aroma from blending Armagnacs aged up to 35 years. Adds Gentzbourger: “We believe that it is essential for consumers to discover Armagnac through tasting and we’re confident that once they have tried Chabot they will be much more likely to purchase. Our strategy for travel retail moving forward is to work with our retail partners to create tasting-based activations wherever possible – for us to taste Chabot Armagnac is to experience the most beautiful of brandies.” About the Armagnacs. Napoléon Special Reserve is a blend of France’s most esteemed Armagnac, some aged up to 20 years. A dark frosted bottle hints at the mahogany and amber hue of the liquid within. The Napoléon retains a balanced and lengthy finish on the palate, with a nose of plums and oak. A well deserved indulgence after a day of conquering. Napoléon Special Reserve is number one in Asia. The X.O. Superior shimmers in a crystal cut glass bottle that is itself a work of art. The brandy is a unique blend of mature Armagnac aged up to 35 years. With a satin golden amber colour and a nose of almond and plum, this Armagnac is full in the mouth with a powerful finish and spicy, long lasting aromas. X.O. is the statement piece in any fine spirit collection.